Nearly 40 years after his death, Bruce Lee is still one of the most recognisable faces in the world. Its invention is credited largely to the Gracie family of fighters from Brazil, who founded the Brazilian jiu-jitsu utilised in "Vale Tudo" combat of the early 20th Century. 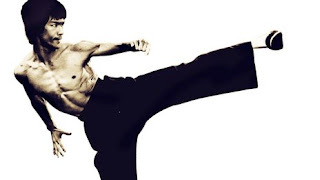 However, Bruce Lee's daughter Shannon Lee agrees it is unlikely that one man or family single-handedly invented something as universal as mixing different forms of combat. "Certainly, there are very few wholly original ideas in the world, there are usually people coming to the same conclusions or carrying out experiments, whether publicly or privately." But she adds: "One thing I will say about my father is that he was very much out in the forefront talking about his beliefs about being a complete fighter and attaching a philosophy to that and teaching it. "While there may have been people prior to him who thought about mixing one or two forms, it was really my father who took it to a public level." "You know how I think of myself? ", Lee said once in an interview. "As a human being.... under the sky, under the heavens there is but one family."